maybe it was my recent trip to charleston, but I am really feeling pineapples lately. pineapples stand for hospitality and warmth and who doesn't love that. I picked up a sweet pineapple shaped dish in charleston for our guest room and my adoration didn't stop there. 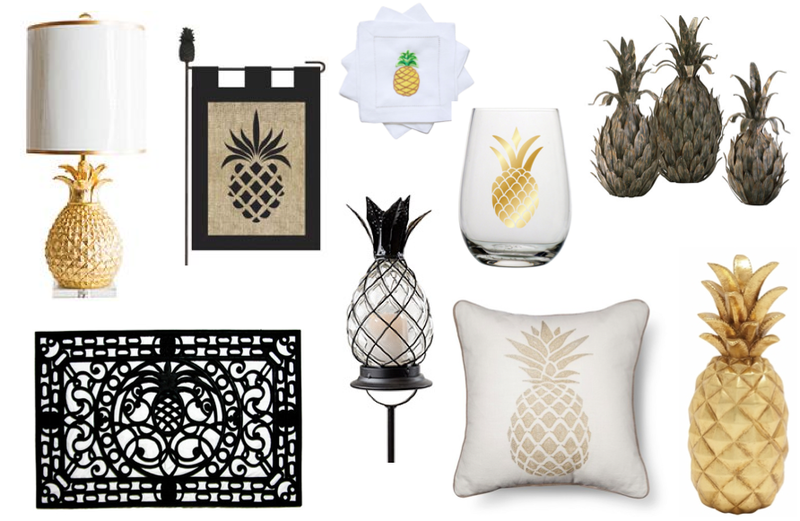 our housewarming party invitations featured a gorgeous watercolor pineapple and I found a white ceramic pineapple to use during the party. when I put it in my kitchen, I realized it was way too awesome to only be for the party and now it lives on the window sill permanently. if you want to up your southern hospitality game, add a few nods to the pineapple in your home. I already ordered the garden flag and am contemplating the door mat. and what a great housewarming gift the wine glasses or napkins would make. I'm forcing myself to say no to the outdoor lantern posts. because obviously I do need them. we'll see how long I can hold out. are you as enamored by the pineapple as I am?